In a Pan, saute the garlic and onion. Mix in the shrimp paste and jackfruit and cook for 1-2 minutes. Add the coconut milk and bring to a boil then turn the heat down to simmer until the vegetable is slightly tender, about 10 – 15 minutes. Stir in the coconut cream to thicken the sauce, together with the long chili peppers. Season with salt (as needed) and ground pepper to taste. Adjust the ingredients according to taste. 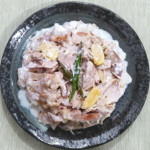 This video shows another recipe for ginataang langka. If you want to add Pork on your Ginataang Langka, saute the garlic and inions and then add the pork and cook until brown.